Here are answers to the most commonly asked questions I get asked on an almost daily basis. What is the Difference Between a Sunset vs Morning/Day Session? Will we still get bright, sunny photos with a sunset session? Do we get the full resolution images, so we can make prints? I use the best professional Canon camera and lenses, the Canon 5d Mark IV, which has more than enough resolution to make gorgeous prints on metal and canvas all the way up to 40 x60. What if we want the full resolution digital images? That option is available. Just add 50% more to any package I offer. Example: $600 Aloha Package would be now be $900 with all full resolution images included. How much do your prints cost? How many prints do we get with our Print Credit? I’m so glad you asked! The following prices are current examples but are always subject to change. Unused print credit is not refundable. Why Do Sunset/Sunrise Sessions Cost More? Two reasons: 1. the color and intensity of sunlight changes very little during a day session as opposed to a sunset session where the light changes dramatically from start to end. This makes sunset sessions twice as much work to edit. 2. There are only seven (7) sunset sessions available per week. First rule of thumb - anything that makes you feel comfortable and confident. That said, we also recommend choosing colors that complement your skin. Bright, vivid, solid colors work really well for Hawaii beach and sunset photography sessions, while black almost never looks good unless it's a formal portrait like an anniversary or engagement session. White only works well if you have tanned or warm-toned skin, and seldom looks good if you're pale unless it's paired with colorful accessories like leis, flower bouquets, ribbons, etc. Think contrast - white with tanned skin, darker colors with pale skin. Try to stay away from stripes, logos or fad clothing... you want images that are timeless and still look good 10 to 20 years from now. Hawaii-themed shirts and clothes look good if they're not too loud or busy. Look through the images on this site and note which styles and colors you like the best. Complimentary colors help make this family photo"pop"
For beach portrait sessions, don't bother with shoes. Wear sandals or slippers (flip flops). You'll be barefoot in the sand with waves tickling your toes for 90% of your session. This is Hawaii after all! Men/boys should wear shorts and women/girls always look best in sundresses or shorts. Wear long pants only if they can be rolled up a little or they just end up getting wet at the bottoms. Yes - and no. I really recommend having a change of clothes available for after the shoot. For you more adventurous folks, it's always fun to get classic shots of you playing in the water or waves hitting your legs. But don't worry, we won't have you get wet until near the end of the session after we've gotten lots of photos. You are always welcome to change outfits during a session but be aware that session time is limited and you'll need to be able to change in public on location. If you really want to change it up, the easiest way is to keep it simple by just changing shirts or accessories. Where do we go for the photo session? Locations can be just about anywhere, depending on your needs and wishes. 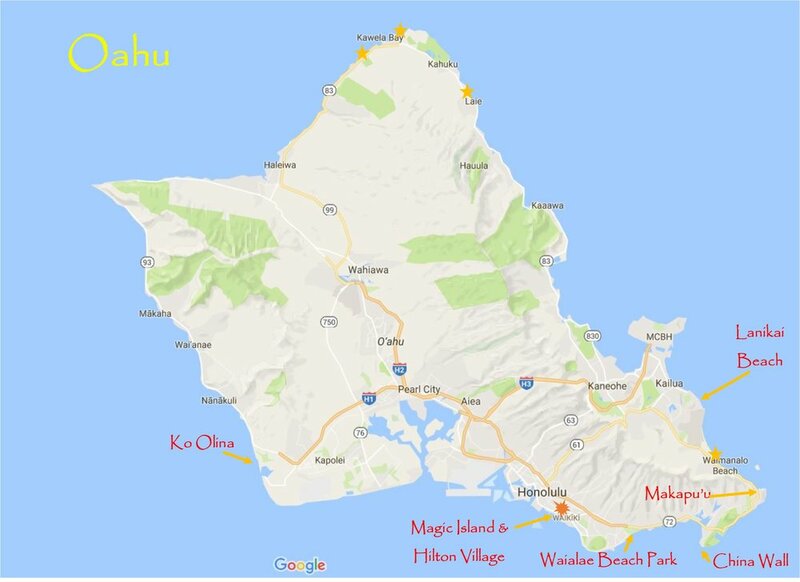 There are three great locations close to Waikiki for those who don't want to go far, and many off the beaten path locations for folks who have transportation and want to explore. If you're a family with young kids, we go to family safe locations. If you're an active young couple who wants proposal photos with a great view, we go hiking up a steep trail for epic views. Click here to see Location options. The weather report says there's a chance of rain! I get worried calls like this often...because the weather report for Oahu always indicates a chance of rain. It rains nearly every day in the mountains of the interior and yet very seldom rains in Waikiki and the beaches of the island. Even when it does rain, 30 minutes later it will be back to fluffy white clouds and sunshine. Unless there is a major storm system, weather here tends to be very localized. With so many beautiful locations and beaches to pick from, we can just drive to another location 15 min away and be back in sunshine. On the rare occasion that it truly is a bad day, I am more than happy to reschedule if at all possible. How Many Photos Do We Get From A Session? The number of images you receive depends on how long the session is but you can expect quite a few! While I never promise an exact number, I generally end up with roughly 150 images per hour, sometimes quite a bit more than that. It depends on how much direction the clients need, the location, the conditions, etc. A couples session almost always means more images are taken simply because there are only two people to pose or work with. Some families can be very focused and we easily end up with 350 images out of a 90 min session. Other families can be totally chaotic and we barely end up with 100. After a session, I edit all images and then upload them to an online gallery for you to view, share with friends and then download to your computer. My philosophy is to give clients as many quality shots as possible, with as much variety as possible. However, quality always trumps quantity. The fewest images I’ve ever delivered for a 60 min session was 75, the most was over 350 and the average is usually somewhere around 200. Why do you need to "edit" photos - can't you just shoot and deliver the jpeg right out of the camera? Well, as a matter of fact, I could do just that... and many cheaper photographers offer that exact service. However, that will never come close to matching the quality of the images you see on this website as that requires extensive editing. Two images blended in Photoshop. Left side is the RAW image that was edited, right side is the straight-out-of-camera jpeg image. Click to enlarge. Most people know that when you take a photo with your camera or cell phone, you immediately have a "jpg" photo. What happens is that after you take a photo, the camera applies the manufacturer's pre-determined amount of contrast, color, white balance, clarity, etc, based on average conditions. This is partly why you will often get inconsistent results. Professional photographers shoot in "RAW" format. Simply put, we set our camera so it only captures the raw data (no processing applied). The photographer then uses software like Adobe Lightroom and Photoshop to hand edit the data, applying contrast, color, white balance, etc, to his or her taste before finally saving the edits as a photo jpg. Unprocessed RAW files give us enormous freedom to edit an image anyway we like - ex: full vibrant color or black & white. Above are two images taken less than 10 seconds apart, with the exact same camera settings...but edited radically opposite to get two totally different results. You can only do this with a RAW file and post processing.